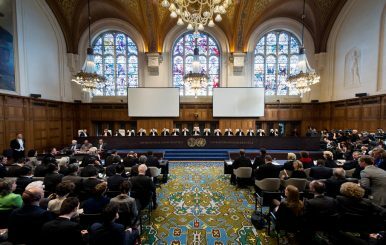 If the world needed a sign that the old global order is collapsing and a new one is on the anvil, the recent tussle for a seat at the International Court of Justice (ICJ) should be enough. It was a contest between an old power, Great Britain, and an emerging one, India. Both fought hard till the end but it was the U.K. that decided to fold. India’s Justice Dalveen Bhandari was re-elected to the International Court of Justice for a nine-year term, after Britain withdrew its candidate, Christopher Greenwood, from the race. The ICJ, comprising 15 judges, was established in 1945 to settle legal disputes between nations in accordance with international law and is the principle legal body of the United Nations. It was a close call till the end. Despite Bhandari reportedly polling two-thirds of the members of the General Assembly in the first 11 rounds, British hopes were alive as in the Security Council, the U.K.’s Greenwood continued to get backing from nine members against five for Bhandari. There were some suggestions that the U.K. would resort to “joint conference mechanism” to get its man in despite legal opinion being against it. But in the end, the U.K. decided to withdraw, ceding the place to India, fearing a negative blowback for ignoring the voice of the majority. And Bhandari obtained an absolute majority, or 183 of the 193 votes in the United Nations General Assembly and all 15 votes in the Security Council in simultaneous elections that were held at the UN’s headquarters in New York. Indian Prime Minister Narendra Modi congratulated Bhandari, calling his re-election a proud moment for India. Britain’s Permanent Representative to the United Nations Matthew Rycroft said, “If the U.K. could not win in this run-off, then we are pleased that it is a close friend like India that has done so instead. We will continue to cooperate closely with India, here in the United Nations and globally.” But there is no denying the significance of this win for India. Britain’s withdrawal signals the first time in 71 years that a U.K. judge will be absent in the UN court. It is also the first time a permanent member of the Security Council has lost to a non-permanent member for a seat at The Hague. Amid all round chaos in the U.K. post-Brexit, this may not register as a big issue for a troubled country at the moment but its long-term implications would be huge. The U.K.’s global standing has been damaged and it is not clear if it can be redeemed in the short to medium term given the scale of challenges facing the country. While many in the U.K. may want to chart out a new course as a “global Britain,” the rest of the world remains skeptical and views the country as one turning rapidly inwards. Britain withdrawing its candidate to the ICJ is also a tribute to smart and aggressive diplomacy by India. Indian diplomats and top political leadership got involved in the process and used their diplomatic capital rather effectively. In many ways, this was what the U.K. would have done in another day and age. It is now India’s turn. New Delhi is now ready to play a larger global role and it is willing to step up to the plate should there be a need. This hunger was absent before but the Modi government has made it clear that it will fight for what it believes India deserves. New Delhi wanted to win this contest and it used all the levers at its disposal. This aggressive streak in Indian diplomacy is refreshing. It doesn’t always work; India has not been able to enter the Nuclear Suppliers Group despite making it a foreign policy priority. But when it works, like in this case of the ICJ, it tells us that indeed a new India is emerging that is no longer risk-averse and is willing to fight it out openly. In this case, of course, the world witnessed how the rise and fall of powers continues to shape the global governance architecture. Can the Nuclear Deal With Japan Get India Into the Nuclear Suppliers Group? How far does the bilateral deal go in legitimizing India as a nuclear state?